The contact elements of the connector are made of high-purity silver, the best electrical conductor of all, in order to ensure optimum signal transmission. The metal is passivated so that the surface does not oxidise and impair contact quality. The inner contact is an active spring contact. The newly developed three-segment tulip contact is pressed onto the central pin of the RCA plug by a surrounding double bronze spring ring. Not only does this ensure reliable contact with non-standardised RCA plugs but contact also remains reliable even after the plug has been connected and disconnected many times over. The outer contact is in the shape of a double wave which encompasses the socket element made of robust Ultramid*. This wave shape guarantees reliable contact with any RCA plug. In addition, the reduction in the amount of conductor material to the absolute minimum prevents the creation of eddy currents, enabling the WBT-0210 to transmit signals that are totally free of distortion. Eddy currents occur in metal components near to which alternating current flows. These currents can result in major signal distortions. *Ultramid is a registered trademark of BASF. Mounting insulators are supplied and ensure not only insulated but also twist-proof mounting and polarity identification. Counter nuts and double step washers with lug are also supplied. 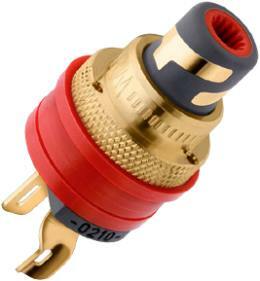 The nut of WBT-0210 Ag Ms is made of brass with a gold-plating finish. The contact elements of the connector are made of high-purity copper, one of the best electrical conductors, in order to ensure optimum signal transmission. The metal is gold-plated (nickel-free) so that the surface does not oxidise and impair contact quality. The outer contact is in the shape of a double wave which encompasses the socket element made of robust Ultramid*. This wave shape guarantees reliable contact with any RCA plug. In addition, the reduction in the amount of conductor material to the absolute minimum prevents the creation of eddy currents, enabling the WBT-0210 to transmit signals that are totally free of distortion. Eddy currents occur in metal components near to which alternating current flows. These currents can result in major signal distortions. The outer contact is made of a special copper alloy and is 24 carat nickel-free gold-plated, not only ensuring excellent conductivity but also preventing oxidation, which could impair the contact quality. 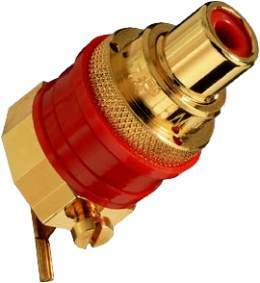 The inner contact is made of pure, highly conductive electrolyte copper and also gold-plated. 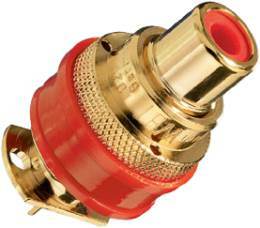 This contact is designed in the form of an active spring contact so that the double prism contact surfaces are pressed onto the central pin of the RCA plug by a surrounding bronze spring ring. Not only does this ensure reliable contact with non-standardised RCA plugs but contact also remains reliable even after the plug has been connected and disconnected many times over. 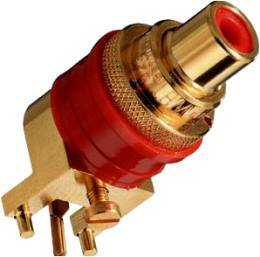 The inner contact is made of pure, highly conductive electrolyte copper and also gold-plated. 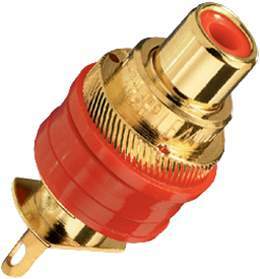 This contact is designed in the form of an active spring contact so that the double prism contact surfaces are pressed onto the central pin of the RCA plug by a surrounding spring washer. 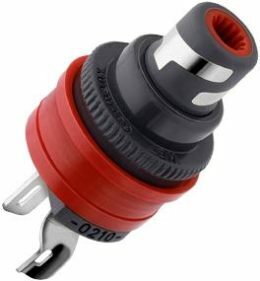 Not only does this ensure reliable contact with non-standardised RCA plugs but contact also remains reliable even after the plug has been connected and disconnected many times over. WBT board sockets can not only be firmly mounted on the outside of the chassis wall using the three-hole nut (brass, gold-plated) but can also be screwed in place on the board using a cylinder head screw. In contrast to standard board sockets, this means that the solder joints are perfectly strain relieved and ideally protected against loosening and accidental disconnection. The cylinder head screw is supplied. The outer contact is made of a special copper alloy and is 24 carat gold-plated, not only ensuring excellent conductivity but also preventing oxidation, which could impair the contact quality. The insulation inside the socket is made of heat-resistant Teflon* – an advantage when the connecting cables are soldered, even with the higher soldering temperature of lead-free solder.